Being industry thought-leaders and game-changers, your event’s speakers are the heart and soul of your meeting. As far as influencers go, they are second to none: they have the reach, resonance, and credibility needed to amplify your event marketing and should be playing an active role in this. Snöball makes it easy for a keynote speaker to promote your event to their large and sought-after network in a way that’s extremely personalized. A keynote speaker will LOVE this mainly because their marketing hinges on promotion – they want to ensure that a room full of attendees are there watching as they walk on stage. They also lead busy lives, and appreciate when the promotional process is simple, copy/paste, plug, and play. With this in mind, we have compiled a list of 5 ways that a speaker can play the role of event marketing partner. We find that videos on Facebook can garner, on average, at least double the number of views and engagements compared to posts with images alone. With tools like Reevio and Lumen5 allowing you to create stunning videos without any technical skill, this is the perfect time to give it a try. But perhaps even easier than that is to simply ask a keynote speaker to sit down with you for a quick live Q&A session. This is a low ask: with no story arc to worry about, prep is simple and the video benefits from an organic feel. As long as the information contained in the video is valuable, it will be well received. If a speaker is unavailable to meet you in person, opt to send them some questions about the significance of their research, for instance, and have them film themselves speaking. Simply put, snöball makes keynote speakers look good. It provides a personalized branded way for them to promote their presence at your event, and this goes a long way toward building their own brand and reputation. The customized landing page generated by snöball checks off all the boxes: it features the name of the keynote speaker, their presentation title, date, time, and a personalized video all packaged within a sleek, on-brand design. The cut-and-paste social media messages also included allow your speakers to easily schedule promotional content into their calendars over the long-term, making them the ideal event marketing partners. One resource most keynote speakers have that is underused by event professionals is their email lists, whether they be newsletter subscribers or simply personal contacts. 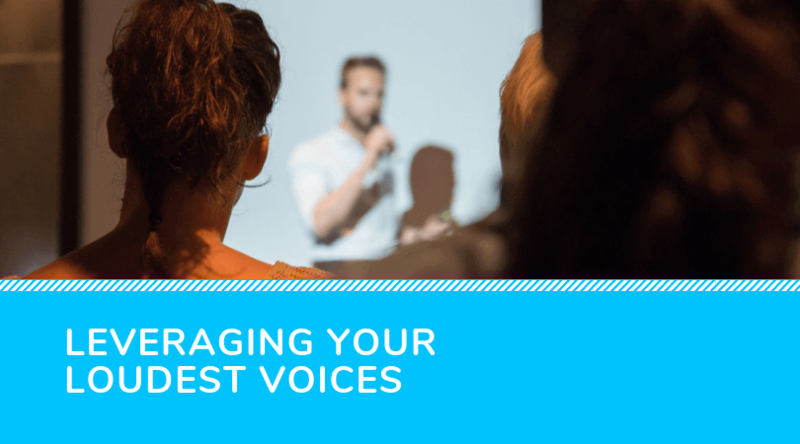 Any keynote speaker will be looking to promote their presence at your event, so send a custom-written blurb their way that they can easily paste into their communications. You can even design a customized snippet in HTML form that a keynote speaker can insert for a more on-brand look. Also, suggest that keynote speakers customize their signature fields to reflect their presence at your event. If you experience any resistance on the part of your newfound event marketing partners, you may propose an in-kind promotion giving them the opportunity to promote themselves or their organization in one of your event’s marketing materials in exchange for them promoting your event. Another great avenue that speakers use to promote themselves is social media. Offer your event speakers custom social media collateral that rises above generic content by including photos, branded graphics with sponsor or affiliate logos, speaker quotes, and more. Be proactive in your own promotions as well by tagging these partners and requesting that they tag your event in their posts. Evergreen content is designed to have a very long lifespan thanks to its versatile and valuable subject matter. The information contained in a video interview with a keynote speaker, for example, can be given new life by being transformed into a blog post. One important factor to note is that the emphasis of your content should be on education, or providing otherwise solid insights that are of value to your audience. Compared to self-promotional style content, stories that provide this “deep learning” stay relevant for a longer period of time and speak to the subject matter that your followers live and breathe by, making them much more click and share-worthy. Your event speakers would love nothing more than to greet large crowds of eager attendees at their session. You as a meeting planner can help make that happen. By having speakers become your event marketing partners, you can tap into their widespread influence. 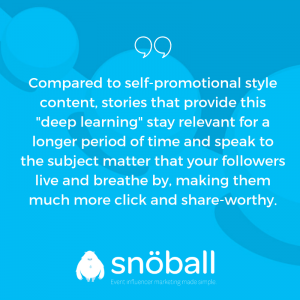 To unlock the full potential of your event’s speakers, give snöball a try. Our event influencer marketing platform was purpose-built to empower your event’s participants at scale with the marketing tools they need to promote their presence at your event, complete with incentivization capabilities and analytics.